Whoever said “it’s the thought that counts” must have worked in the aid industry. Last month, the guy who started iwearyourshirt.com decided he wanted to “give back.” And where else to start but Africa, right? The new charity is called 1millionshirts.org, and was originally designed to collect used t-shirts to send to 11 countries (Kenya, Uganda, DR Congo, Ghana, Liberia, Mozambique, Nigeria, Ethiopia, Sudan, Swaziland, and South Africa). On the surface, it might seem like a nice idea. All of these countries have high rates of poverty, and it’s certainly laudable to want to help meet people’s needs. Projects like this often amount to export dumping, which hurts local economies. The cost of shipping huge quantities of low-value t-shirts from the United States to Africa is prohibitively expensive. That money could be put to better use on local projects in the targeted countries. By way of alternative ideas, instead of starting a new NGO, there’s always the option of helping an established group already working in (or better yet, run by) the local community one wants to help. Or, as Texas in Africa suggested, one could help African textile manufacturers and cotton producers by purchasing t-shirts from African vendors themselves. Somebody please tell me exactly when aid became about the donor? Why do we insist on coddling people with bad aid ideas just because they “mean well” or their “heart’s in the right place”? Why is it so hard for everyone to remember that aid is not about the [EXPLETIVE DELETED] donor? From the good criticism and thoughtfulness of the right people (meet: @tmsruge & mjamme) we are learning that what we were trying to do was wrong. 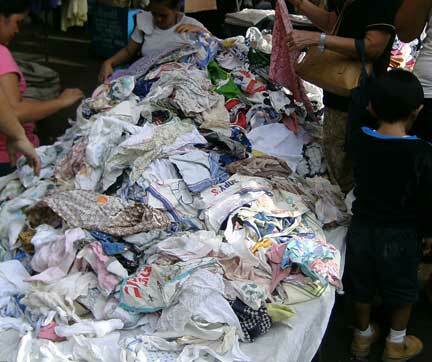 While on the surface it may look like there are people in villages/countries in Africa that could use clothing, there is a bigger issue and we would have done more harm than good by simply donating 1,000,000 t-shirts. One thing I personally want to do with this project is to help educate people who were/are in the same position I was/am. There isn’t a clear resource that explains the ins and outs of what people in other countries around the world need. I’m not saying I’m going to create that, what I am going to try to do is educate people through this website as I continue to learn.